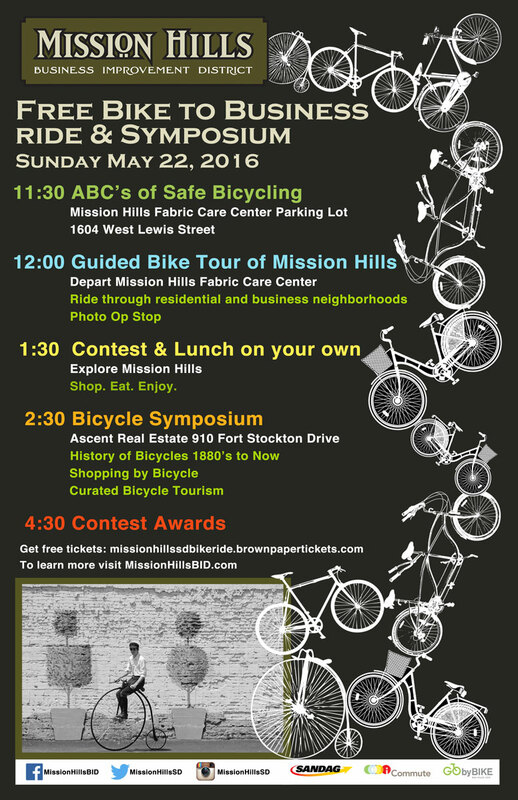 The Mission Hills Business Improvement District, through a generous grant from SANDAG, iCommute, & GO by BIKE, is hosting the Mission Hills Community Bike to Business Ride & Bicycle Symposium on Sunday May 22, 2016 from 11:30AM until 4:30PM. Please join us for this fun-filled family friendly Community Bike to Business Ride. The event is completely free for everyone, but, due to space restrictions, the bicycle symposium requires a free ticket through Brown Paper Tickets. 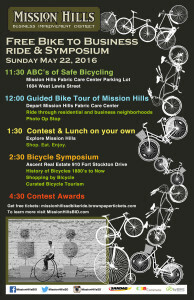 The events of the day will begin at 11:30AM with a bicycle safety session, followed by a guided bike ride, and a photo opportunity stop in Mission Hills. Beginning at 1:15PM everyone is encouraged to eat, shop and ride on your own time while competing in the “Hey Big Wheeler!” contest. A symposium with film shorts and bike talks will begin at approximately 2:30 p.m. (See Schedule listed below along with FAQ at the bottom). A group photo will be taken at a picturesque location in Mission Hills. A photographer and a historic big-wheel bike and its owner will be available. This opportunity will add to the days experience and memory. The symposium will offer bike themed talks and demonstrations on the role of the bicycle throughout history, the variety of bicycles, such as eBikes and cargo bikes, available in today’s marketplace, bicycle riding safety information, ways to carry items on a bicycle, as well as curated bicycle tourism. 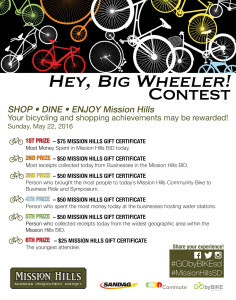 Families, neighbors, and friends ride your bicycles around Mission Hills and play the “Hey Big Wheeler contest. Your bicycling and shopping achievements will be rewarded! The contest may include such categories as “Youngest Bicyclist”, “Bicyclist Who Covers the Largest Geographic Area in the BID”, “Bicyclist Who Brings the Most People to the Event”, “Most Money Spent in the BID”, and more. Restaurants and other businesses in the BID are in on the fun and want to encourage bicyclists to explore and discover how easy it is to shop and get around by bike. See map for thirst quenching water station locations throughout the BID. 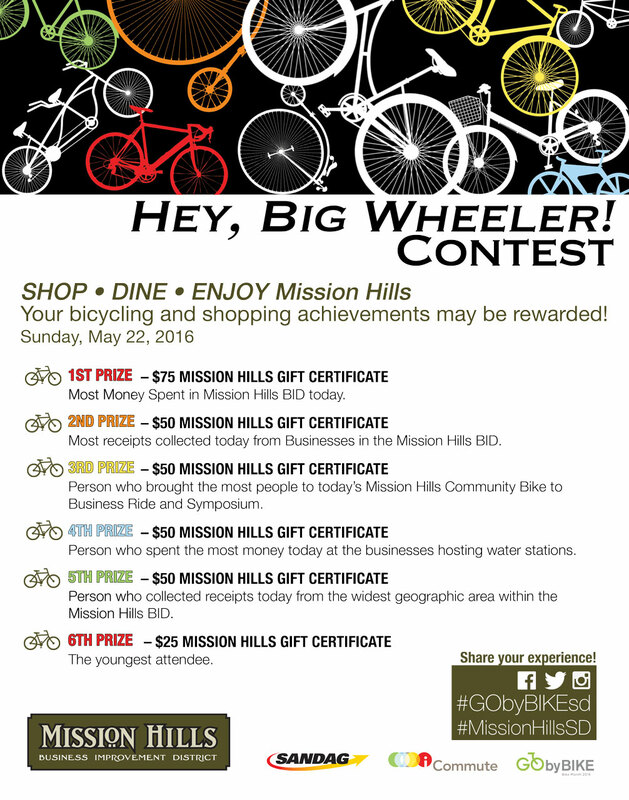 Eat, Shop and Ride while competing in the “Hey Big Wheeler!” contest. Visit our directory for ideas of businesses to check out! A: No, people of all ages are welcome and encouraged to experience Mission Hills, by bike! A: Yes, people of all ages may participate, and join us, or leave at anytime throughout the scheduled event. The ticket is required so that the event organizers may plan accordingly. Space is limited at the symposium. A: Maps will be distributed at the 11:30 a.m. bicycle safety portion of the event (See Schedule of Event above). The maps will identify the bike route(s) participants will be encouraged to take. A: Water stations will be identified on the map. Participants are encouraged to bring their own water bottles, just as they would on any other bike ride. In addition, Mission Hills has many food and beverage establishments so this will be a great way to try something new! A: Venues offering specials for those participating in the Mission Hills Community Bike to Business Ride and Symposium will be listed on the map.